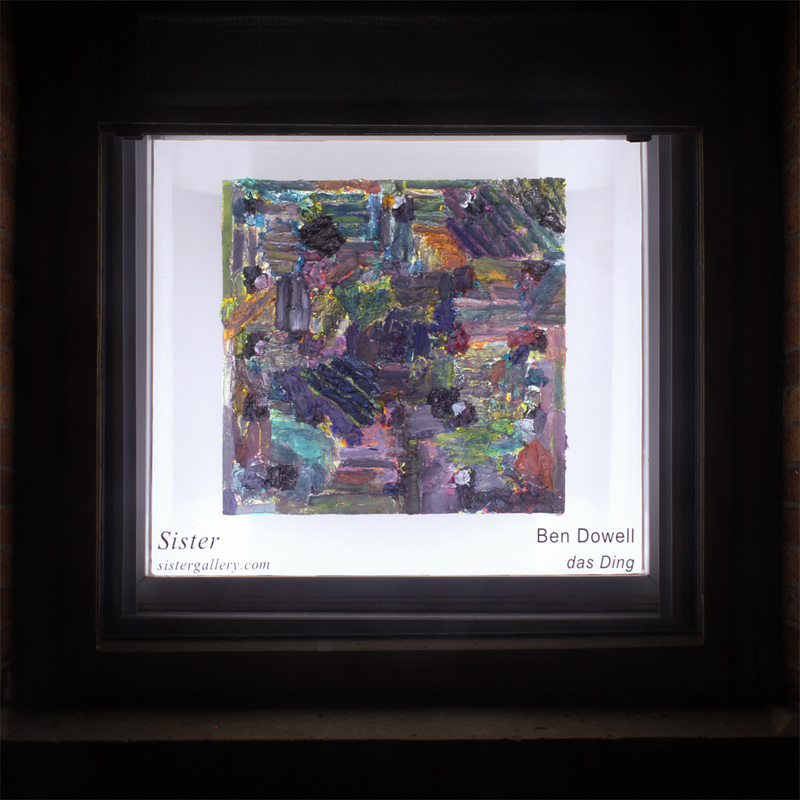 Sister is pleased to present "das Ding" an exhibition by painter Ben Dowell. For some time Dowell has made his paintings with a single brush stroke; a chunky impasto line that stutters in short bursts across the surface with a nearly mechanized attack creating peaks and taffy like pulls of excess oil paint. While older works followed a geometric pattern-like composition tracing the rectangular contour inwards toward logical points, his recent works allow the marks to overlap and collide; their compositions collapsing inward, simultaneously and literally bulging out of the center with an accumulation of dense marks. "das Ding", german for "the Thing", is a concept which explores the impossibility of pure objectivity. Also known as "the thing in itself" or the thing in its "dumb reality" it is an idea which is pure, that exists independent of language, consciousness or subjectivity. In psychoanalysis das Ding may also be seen as an assertion of the unconscious that is categorically indescribable; whose existence is visible only though it's absence from signification. It is a peculiar term when applied to art making. Seemingly all art participates in this "thing" conception, pulling at something that is beyond our ability to understand it fully. In some ways the asymptotic arc of modernism can be seen to approach this "ding-ness" yet never fully arriving. For this exhibition a darkly washed, dense and knotty Untitled painting from 2015 has been made to float in front of a circular space with no hard edges. It has been lit frontally so as to cast no downward shadows and set to slowly fade in and out with programmable daylight LED's. This "pure" space is undermined by the slow throbbing lights, gradually brightening then dropping off into darkness. The subtle theatricality adds elements both anthropomorphic (the space is "breathing") and phenomenological (your eyes continuously attempt to readjust to the color) and hints at the dialectical and contradictory idea of das Ding; perpetually beyond our grasp but urgently present in every act of thinking.